I don't know if it's been the same where you are this winter, but here, circle scarves or infinity scarves have been a HUGE trend. It seems like practically everyone's wearing them. They're practical too - it's a scarf that won't fall off, like an oversized cowl. It drapes well and there's no knot sitting uncomfortably around your neck. 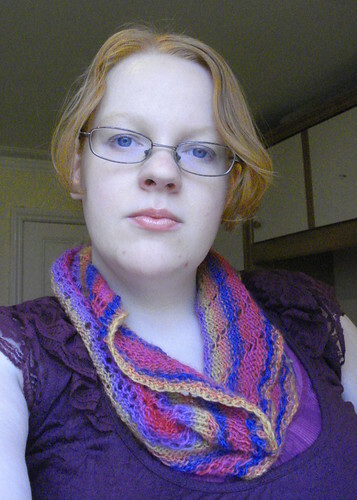 My latest knitting obsession takes on the circle scarf, with a twist (actually, a half-twist). Have you ever heard of a Möbius strip? It's a band with a half-twist, and when you run your finger around it, you find that the two sides are actually one. The inside is the outside; the outside is the inside. Using the moebius technique perfected by Cat Bordhi, a variation on the provisional caston without waste yarn, you knit the mobius from the middle outwards. The result is one edge is in stockinette, and the other edge is in reverse stockinette, with the divide along the equator of the strip. Here's Cat Bordhi's video tutorial for casting on a moebius. She also has two whole books of moebius patterns, A Treasury of Magical Knitting and A Second Treasury of Magical Knitting. Here's some written instructions and here's another set. The cast-on is the hardest part of the mobius; the rest is all knitting. I can see all sorts of exciting design possibilities with reversible stitch patterns and the mobius. I've already knit two, with plans for more! The article is very interesting and nice, I hope you can also visit my website resep kue thank you!